Violet Crown Spring Festival – May 2nd! Join me at Violet Crown Community Works’ – Violet Crown Festival in Austin. This is a great festival to people watch, bring the kids and play games or do art projects, listen to eclectic music, and get a tarot reading by Christine! 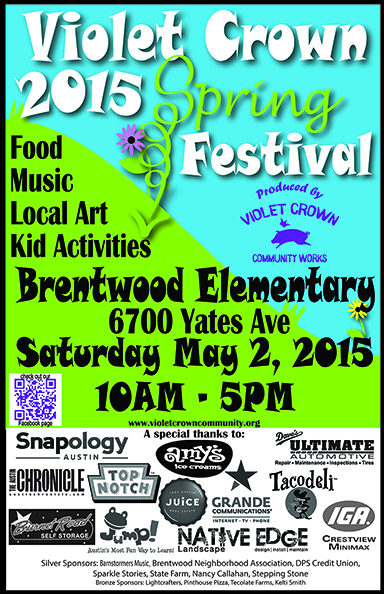 Booths will be set up in the parking lot of Brentwood Elementary. Good routes in are Arroyo Seco from 2222 or Justin Lane (from Burnet or Lamar). See the Violet Crown web site for the food and music lineup! This entry was posted in Events, Tarot/Oracle and tagged Austin, Austin psychic, Austin tarot, Brentwood, Violet Crown on April 25, 2015 by christinethepsychic.